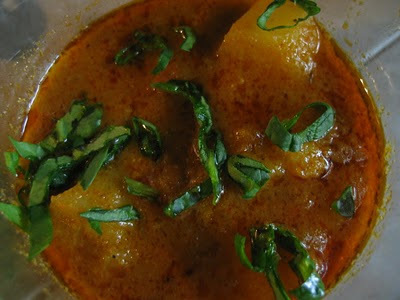 Nisha's Kitchen: Rase Ke Aloo / Potato in onion tomato mild spicy gravy. Rase Ke Aloo / Potato in onion tomato mild spicy gravy. Aloo is the quintessential vegetable in Indian kitchen. Back in days potato used to be the only vegetable available " always "in the pantry. And every mom has a rasa ke wala aloo recipe which will be her go to recipe whenever no other vegetable is there in her kitchen.This is one such recipe. Even though these days we all have some or other kind of frozen vegetables always in our freezers but still i like to cook this up once in a while and serve with roti. Aloo - 4 medium sized , each cut into four or six pieces. 6. Drop the cubed and washed potato into the mix. 7. Add 1 to 11/2 cup of water and salt. 8. Cover and simmer till potato is done. mmmm lovely yummy delicious, slurp slurp.. This aloo spicy gravy looks mouthwatering!!! Wonderful dish, its the simple ingredients and patience that give us wonderful dishes!!! thx so much.. i tried it and the first time itself it came our awsm..